If you grow tomatoes as part of a larger vegetable plot, you might want to include them in a crop rotation plan, along with the other vegetable crops, to protect them from pests and diseases. Growing the same crops year after year in the same soil can lead to a build-up of soil-borne pests and diseases. 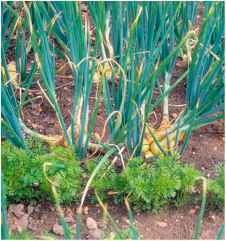 If you rotate annual crops around the garden so that they are not grown in the same area again for at least three years, you should avoid such a build-up. Closely related vegetables (from the same plant family) are usually grouped together for crop rotation since they will be prone to the same pests and diseases. The practice of crop rotation has other benefits. It helps to make efficient use of the soil nutrients. 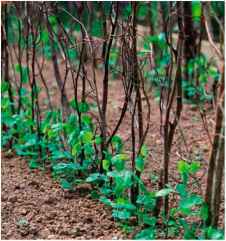 Also, alternating between deep-rooted crops and more fibrous-rooted ones can help to improve the soil structure. However, the rotation needs to be carried out over a much longer time frame than the usual three or four years to be completely effective, and keeping to a strict rotation in a small garden may be impractical. 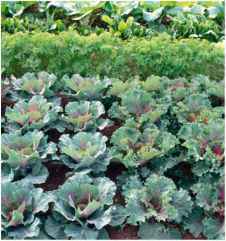 To follow a four-year crop rotation, divide the vegetable garden into four areas. On the first plot, grow tomatoes and other members of the same (Solanaceae) family, such as eggplant and potatoes. 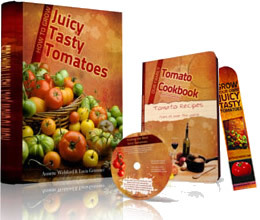 You can also include root crops, such as carrots and beets, with this group. In the second year, move the tomatoes and roots to the second plot, and in the first plot grow members of the onion family. In the third year, move the tomatoes and roots to the third plot, the onions to the second plot, and grow legumes (peas and beans) in the first plot. Most vegetables in the legume family have nodules on their roots; these house bacteria that can fix, or store, nitrogen from the soil, making it available for the following crop. It is traditional to follow legumes with nitrogen-hungry brassicas, such as cabbages and broccoli, before using the same ground for tomatoes and root crops again. 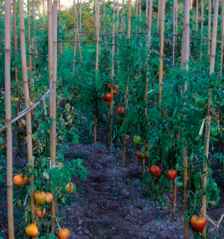 If possible, grow tomatoes and potatoes with a buffer zone of plants between them. Keeping soil fallow—growing nothing on it for a season—will reduce populations of some soil-borne pests, such as root-knot nematodes (microscopic worms); they will die out through lack of food. Dig over the soil to expose the nematodes and other pests to the drying sun and to feeding birds. This will refresh the soil ready for growing next year. 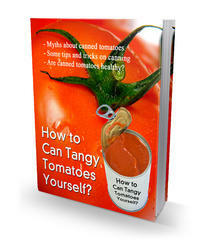 What crop can i grow the year after tomatoes? What should follow tomatoes in crop rotation?